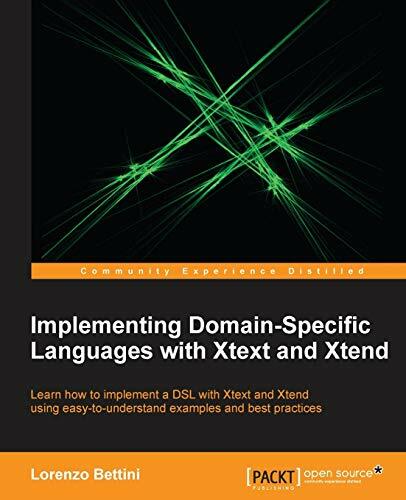 "Implementing Domain-Specific Languages with Xtext and Xtend" will teach you how to develop a DSL with Xtext, an Eclipse framework for implementing domain-specific languages. The chapters are like tutorials that describe the main concepts of Xtext such as grammar definition, validation, code generation, customizations, and many more, through uncomplicated and easy-to-understand examples. 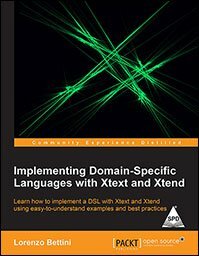 "Implementing Domain-Specific Languages with Xtext and Xtend" aims to complement the official Xtext documentation to explain the main concepts through simplified examples and to teach the best practices for a DSL implementation in Xtext. It is a Beginner’s Guide which should set you up for professional development DSL and its Eclipse IDE tooling. Lorenzo Bettini is an assistant professor (Researcher) in computer science at Dipartimento di Informatica, Università di Torino, Italy. Previously, he was a Postdoc and a contractual researcher at Dipartimento di Sistemi e Informatica, Università di Firenze, Italy. He has a Masters Degree in computer science and a PhD in theoretical computer science. His research interests cover design, theory, and the implementation of programming languages (in particular, object-oriented languages and network-aware languages). He has been using Xtext since version 0.7. He has used Xtext and Xtend for implementing many Domain Specific Languages and Java-like programming languages. He is also the author of about 60 papers published in international conferences and international journals. You can contact him at http://www.lorenzobettini.it.